Power over Ethernet (POE) is a technology that lets network cables carry electrical power. 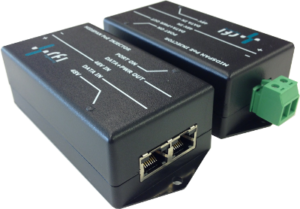 RFI Engineering's U-router and LoRa gateway are both powered using Power over Ethernet power supplies. The RE.99.PPOE universal 20 Watt PoE power supply provides power to devices through RJ45 jacks and data over a single Ethernet cable. This compact, self-contained device provides an efficient and cost-effective solution to systems designers confronting the need for additional electrical outlets or the placement of network access points. The RE.99.1POE is a single port IEEE 802.3af compliant power injector that runs entirely on standard 48V DC, as commonly found on remote telecom sites. The power injector gives you a quick, safe, and economical way to add PoE to existing non-PoE network links. Simply run your Ethernet line through the injector to power remote LoRa Base stations, VoIP phones, surveillance cameras, wireless access points, and other PoE equipment. 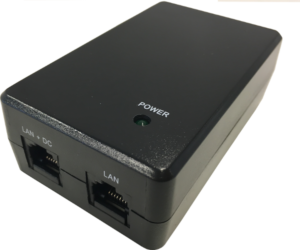 The RE.99.3POE is a three port IEEE 802.3af compliant power injector in a 1HE 19 inch enclosure. The unit runs entirely on standard 48V DC, as commonly found on remote telecom sites. The power injector gives you a quick, safe, and economical way to add 3 PoE outlets to a telco installation. Simply run your Ethernet line through the injector to power remote LoRa Base stations, VoIP phones, surveillance cameras, wireless access points, and other PoE equipment. Flexibility - without being tethered to an electrical outlet, devices such as our U-router or L-gateway can be located wherever they are needed most, and repositioned easily if required.